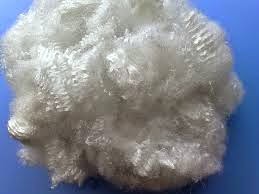 A manufactured fiber in which the fiber forming substance is any long-chain synthetic polymer composed of at least 85% by weight of an ester of a substituted aromatic carboxylic acid, including but not restricted to substituted terephthalic units, p(-R-O-CO- C6H4-CO-O-)x and parasubstituted hydroxy-benzoate units, p(-R-O-CO-C6H4-O-)x. Cut lengths available are 32, 38, 44, 51 and 64mm for cotton type spinning and a blend of 76, 88 and 102 mm - average cut length of 88m for worsted spinning. The most common cut length is 38 mm. For blending with other manmade fibres, spinners preferred 51mm to get higher productivity, because T.M. will be as low as 2.7 to 2.8 as against 3.4 to 3.5 for 38mm fibre. If the fibre legnth is more, the nepping tendency is also more , so a crompromise cutlength is 44 mm. With this cut length the T.M. will be around 2.9 to 3.0 and yarns with 35 to 40% lower imprfections can be achieved compared a to similar yarn with 51 mm fibre. In the future spinners will standardize for 38 mm fibre when the ring spinning speed reaches 25000 rpm for synthetic yarns. Air jet spinning system uses 38 mm fibre. Polyester fibers are available in 4 tenacity levels. Crimps are introducd to give cohesion to the fibre assembly and apart from crimps/cm. Crimp stability is more important criterion and this value should be above 80% to provide trouble free working. A simple check of crimp stability is crimps/inch in finisher drawing sliver. This value should be around 10 to 11, if lower, the fibre will give high fly leading to lappings and higher breaks at winding. Spin finish also gives cohesion, but cohesion due to crimp is far superior to the one obtained by finish.To give a concrete example, one fibre producer was having a serious problem of fly with mill dyed trilobal fibre. Trilobal fibre is difficult to crimp as such, so it was with great difficulty that the plant could put in crimps per inch of 10 to 11. Dyeing at 130 degrees C in HTHP dying machine reduced the cpi to 6 to 8. Mills oversprayed upto 0.8% did not help. Card loading took place yet fly was uncontrolled, ultimately the fibre producer added a steam chest to take the two temperature to 100degrees plus before crimping and then could put in normal cpcm and good crimp stability. Then the dyed fibre ran well with normal 0.15 to 0.18 % added spin finish. Several types of spin finishes are available. There are only few spin finish manufacturers - Takemoto, Matsumoto, Kao from Japan, Henkel, Schill &Scheilacher, Zimmer & Schwarz and Hoechst from Germany and George A.Goulston from USA. It is only by a mill trial that the effectiveness of a spin finish can be established. A spin finish is supposed to give high fibre to fibre friction of 0.4 to 0.45, so as to control fibre movement particularly at selvedges , low fibre-metal friction of 0.2 to 0.15 to enable lower tensions in ring spinning and provide adequate static protection at whatever speed the textile machine are running and provide enough cohesion to control fly and lapping tendencies and lubrication to enable smoother drafting. Spin finish as used normally consists of 2 components - one that gives lubrication / cohesion and other that gives static protection. Each of these components have upto 18 different components to give desired properties plus anti fungus, antibacterial anti foaming and stabilisers. Most fibre producers offer 2 levels of spin finishes. Lower level finish for cotton blends and 100% polyester processing and the higher level finish for viscose blend. The reason being that viscose has a tendecy to rob polyester of its finish. However in most of the mills even lower spin finish works better for low production levels and if the production level is high, high level spin finish is required if it is mixed with viscose. For OE spinning where rotor speeds are around 55000 to 60000 rpm standard spin finish is ok, but if a mill has new OE spinning machines having rotors running @80000 rpm, then a totally different spin finish which has a significantly lower fibre - fibre and fibre - metal friction gave very good results. The need to clean rotors was extended from 8 hours to 24 hours and breaks dropped to 1/3rd. Effectiveness of spin finish is not easy to measure in a fibre plant. Dupont uses an instrument to measure static behaviour and measures Log R which gives a good idea of static cover. Also, there is s Japanese instrument Honest Staticmeter, where a bundle of well conditioned fibre is rotated at high speed in a static field of 10000 volts. The instrument measures the charge picked up by the fibre sample, when the charge reaches its maximum value, same is recorded and machine switched off. Then the time required for the charge to leak to half of its maximum value is noted. In general with this instrument , for fibre to work well, maximum charge should be around 2000 volts and half life decay time less than 40 sec. If the maximum charge of 5000 and half life decay time of 3 min is used , it would be difficult to card the fibre , especially on a high production card. Normally measured at 180 degree C for 30 min. Values range from 5 to 8 %. With DHS around 5%, finished fabric realisation will be around 97% of grey fabric fed and with DHS around 8% this value goes down to 95%. Therefore it makes commercial sense to hold DHS around 5%. L colour for most fibres record values between 88 to 92. "b" colour is a measure of yellowness/blueness. b colour for semidull fibre fluctuates between 1 to 2.8 with different fibre producers. Lower the value, less is the chemicals degradation of the polymer. Optically brightened fibres give b colour values around 3 to 3.5. This with 180 ppm of optical brightner. Each fibre producer has limits of 100 +- 3 to 100+-8. Even with 100+-3 dye limits streaks do occur in knitted fabrics. The only remedy is to blend bales from different days in a despatch and insist on spinning mills taking bales from more than one truck load. The right way to measure is to card 10 kgs of fibre. Collect all the flat strips(95% of fused fibres get collected in flat strips). Spread it out on a dark plush, pick up fused and undrawn fibres and weigh them. The upper acceptable limit is 30mgm /10kgs. The ideal limit should be around 15mgm/10kgs. DUpont calls fused/undrawn fibres as DDD or Deep Dyeing Defect. Extra dull : 0.7% TiO2 and in optically brightened with normally 180 ppm of OB, OB is available in reddish , greenish and bluish shades. Semi dull is the most popular lustre followed by OB (100 % in USA) and bright.